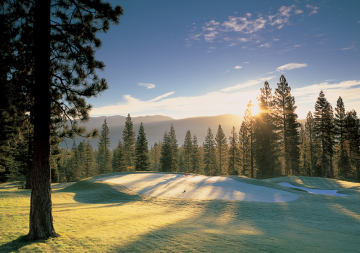 Schaffer’s Mill real estate is comprised of a golf course community featuring 475 acres located in the Martis Valley close to downtown Truckee and Northstar. This community is perfect for the outdoor enthusiasts that prefers a smaller mountain town living in style. The developers have positioned their offering as an alternative to their neighbors, Martis Camp and Lahontan. A Sunset Magazine home was recently constructed and raffled to a lucky winner. There is a lot of national focus on Schaffer’s Mill. Just at Schaffer’s Mill alone, there is an 18 hole championship golf course, cross country ski trails, stocked fishing ponds, walking trails and the national Tahoe forest at your back door. The brand new beautiful club house includes a pool, bar, restaurant and a community lawn known as Schaffer’s Square. If you are looking for adventure outside of this golf course home community there are ample opportunities just a stone’s throw away. Downtown Truckee offers plenty of shopping and dining. The towns along North Lake Tahoe’s shoreline are 15 minutes away along with some of the best ski resorts in the Sierra. There is a club room at Northstar at Tahoe, shuttle service to Northstar, Lake Club room at Jake’s on the Lake and the use of a 48′ Sunseeker Yacht. Schaffer’s Mill real estate features 188 Mountain Lodges and 218 single family homes. The Schaffer’s Mill Golf Course home sites range in size from .25 acre to .75 acre. The community has golf course home sites for you to design your dream home or pick from one of the many pre-designed townhome plans. Each plan offers you the opportunity to create a dream home in this unique setting tailored to your personal style and comfort. Design guidelines assure that every home at Schaffer’s Mill will maintain the same commitment to harmony and value. The luxurious Mountain Lodges feature 3 to 4 bedrooms ranging from 2,000 to 2,600 in square feet. The styling of these Schaffer’s Mill homes for sale are reminiscent of the Schaffer’s Mill heritage and really encompass that classic Tahoe Mountain Lodge look and feel. All models feature separate laundry rooms, two car garages, large decks and the maintenance and landscaping. Also available at Schaffer’s Mill are a collection of 5 luxury cabin designs. The Settler’s Cabin, The Cascade, The Tahoe, The Sierra and The Trailhead are exceptional homes available with mountain and golf course views. You can choose any one of the designs and customize to your liking. These luxury cabins are the perfect retreat for friends and family ranging in size from 2,500 to 3,000 sq. ft.
We’ve helped over 2,200 families find their ultimate vacation home or primary residence. We know Schaffer’s Mill very well helping numerous clients with their purchase. Contact us to become another Davis Yoder Group satisfied customer. It’s a premium club made up of people who have sought out the best and found it.